Hello! I’m not green, but I’m here to wish you a Happy St. Patrick’s Day just the same. I am mighty cute and that counts for something, doesn’t it? Songbird is busy writing lesson plans so she asked me to handle this Fun Monday St. Patrick’s Day post hosted by Nikki. Nikki also asked for green beer stories. Neither Songbird nor I have ever had green beer. In fact, I ‘ve never had beer of any color. And that’s a radio antenna sticking up behind my head in case you’re wondering. We were listening to the Razorback game while sitting on the back porch. I participated in the very first Fun Monday and here is the link to that post. This is my very first post ever. As you can see, Jasper actually started my blog. He is still a very industrious little canine. Check out the full list of Fun Monday participants over at Vicki’s place. My name is Jasper. 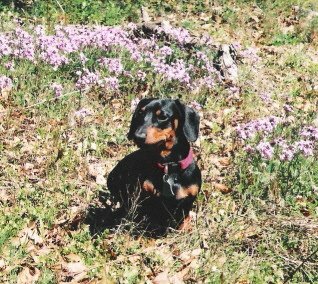 As you can see, I am a handsome fellow who has no problem posing in the midst of purple flowers. I am a miniature Dachshund. My hobbies are digging, chasing rabbits, digging, wrestling with my cat, digging and going on long walks with my human. My human spends a lot of time wondering why I like to dig so much. She uses a shovel and digs in the woods near our house so I know she understands the whole digging concept. My human puts the dirt she digs in a big, red wheelbarrow. She pushes the wheelbarrow around the lawn and puts her dirt in all the holes that I have spent countless hours digging. I don’t understand her obsession. My holes are terrific. They are all different shapes and sizes. When it rains, they are all full of water which is very convenient when I am working outside and need a quick drink. My human also digs in large areas she calls gardens and beds. These areas are off limits for me. My human sticks things like flowers, herbs and vegetables in the holes she digs then she fills the holes up. What is that about? She doesn’t even bury the stuff. March 30, 2006 at 3:41 am eJasper is a handsome little devil! I also really like how his little brain works and how well he can express himself. I was wondering what he thinks about the garden hose. Maybe you could ask him. March 30, 2006 at 4:12 am eI was going to post anonymous comments, but I see you’d don’t allow them! So I’ll post un-anonymously, and say that Jasper is quite the writer! I had a choir trip that took up most of my day so I didn’t get to play with my new toy until this evening. Luckily, I had a very handsome male model on hand. I have to figure out how to get rid of those blue eyes. Probably need to try a different scene mode or flash setting. But what a great angle on the nose! I hope everyone had the best of holidays. I really enjoyed having Songbird at home for two whole weeks. We did so many fun things together. We visited with Songbird’s family at her Mom’s house. There were a lot of people there including some pesky little children. Songbird told them to be careful around me because I don’t really like kids too much. That is certainly the truth. I don’t know how Songbird can stand being with kids all day at her job. She has more patience than I do. I’m glad she has that job though because she gets money to buy me dogfood and doggie treats. Songbird and I went on long walks almost every day and we also sat on the sofa and watched movies and read books. One day we even went outside and dug holes in the ground and raked up piles of leaves. Oh, yeah, we also played in the snow on the day after Christmas. All in all, we had a great holiday vacation except for one thing. Songbird broke our car. She didn’t mean to. It was an accident. At first, we had a rental car. I had to sit on a blanket when I rode in that car because it didn’t belong to us. We were paying to use it. In fact, we were having to pay so much to use it that Songbird was worried about having enough money to buy dogfood and doggie treats so I was glad when she gave the rental car back. At the same time, I was worried because we didn’t have anything to drive so every morning I went out to the carport to check and see if our car had made it home yet. It’s been twenty days and our poor car still isn’t home, but I still check just the same. The really bad thing is I never know what Songbird is going to leave in and I sure never know what to expect when she comes back home. Sometimes she is in her Mom’s truck. Sometimes she is in our neighbor’s, Mrs. M., red car. And today Songbird came home in a big silver truck that belongs to Mr. Roger. Mr. Roger is Tiggerlane’s husband. Now, I’m sure thankful that Mr. Roger loaned us his truck so Songbird can go to work and earn money, but I am so confused. I never know if I should bark because an intruder is driving up to our house or if it is just Songbird in someone else’s vehicle. I sure will be glad when we get our very own car back. All these different cars and trucks are making me so confused that I have a headache. I am just going to lay here under my blanket with my favorite horse pillow tonight. I wish I could take some aspirin. Maybe if I keep looking real pitiful Songbird will give me a doggie treat. One last thing, please be careful and don’t break your car. I live on a dirt road. Not gravel, not crushed rock. Dirt. Luckily, I have a long drive way. My house sits off the beaten path completely surrounded by woods. I say ‘luckily’ because the road I live on is what is known in these parts as a ‘beer joint road’. It is a back way connection from the highway in a dry county in Arkansas to the beer joints just across the line in Oklahoma. Now we don’t need traffic lights out here in the sticks yet, but we do get a little busy on the weekends. People who live in the edge of Oklahoma also use the road as a short cut to get to the nearest town of any size. And there are drivers who find my road convenient because they don’t have insurance or because their vehicles are in such a state of disrepair that they try to avoid state highways. Then there are people, like me, who live out here in the country and use the road because it is the only way to get from here to there, wherever there may be. Jasper and I walk the road almost every day. Usually late in the afternoon or early evening. I put his harness on his little 10-pound body, snap on the leash and off we go. Jasper likes to step lively and on some days I am practically jogging to keep up with his pace. As we walk, we meet the people who, for whatever reasons, are driving on our road. Now I know just about everyone who lives on this road and if a neighbor drives by us they usually stop and speak. At the very least, the people who know Jasper and me, slow down as they wave and pass us by. I consider the fact that they slow a down an act of courtesy rather than neighborliness. When conditions are dry, as they are now, the dust from a passing vehicle is awful. So slowing down to keep the dust from enveloping us is a very nice thing to do. I have to agree. Jasper is a mighty “cute little feller” even though I can’t get him to sit still for a picture!